Rarely do I wax lyrical about the merits of a record label in print, other than the occasional acknowledgement of the continuing success of some of the more established, most prolific, or perhaps the "elder statesmen" of the scene. However in the case of Afe Records, I have been enchanted and re-educated, assuming on first sight that this little label was in its first fledgling years. On receipt of a clutch of exquisitely packaged CD-Rs, and a cursory tour of the label's website, I learn that in actuality, Afe have just celebrated their 10th year of recording activity, taking in some of the most interesting and diverse artists in the experimental scene. Afe, short for Another Friendly Edition, effortlessly manage to breach a selection of genre boundaries with their releases, and have perhaps been responsible for giving a home to the more marginalised representatives of the scene – releasing obscure but worthy artists in small collector editions of 100 copies. Occasionally, the label releases full editions with greater publishing runs, but in the main, they seem content to focus energy on their editions. Amongst the collection of CDs currently inhabiting my players, is the now more familiar presence of John Hudak, whose work I last encountered on Japan's Spekk label, and later in NVO's Extract book. Hudak turns in a classic and delightful series of recordings of doves on the aptly named "Miss Dove, Mr Dove". Hudak's keen artistic ear picked up the sound of cooing doves whilst on a break in the Czech Republic, and realising the auditory potential of the birdsong, combined with a natural echo between two buildings, took recordings and then subjected them to various treatments back at his studio. The overall sound is at once slightly haunting and spiritually uplifting, as the birdsong undergoes all manner of transformations, and quietly subtle transitions. Tiziano Milani's "Im Innersten" consists of three long-form pieces, elegantly fusing organic minimalism with something that approaches clicks'n'cuts territory. Milani capably splices delicate textural glockenspiel with a rangy pallette of bleeps and blips, field recordings, and subtle harmonics. The overall feel is sedately paced, crisp and beautifully executed. Perhaps one of my favourites of this handful of releases. Fine stuff indeed. Luca Bergero works under the project name of Fhievel, and his curiously entitled "Pipe Smoking On a Balloon" almost transcends categorisation. With a background in microsonics, and a penchant for capitalising on his more leftfield leanings, Bergero's instrumentation bears the patina of decay, each sequence being infused with granular layerings, and as with Tiziano Milani, he deploys various bleeps and oblique tonalities. "Pipe Smoking On a Balloon" shifts and shimmers quietly, crackling and popping like waves over shingle, a hugely engaging and captivating release, and well worth checking out if, like me you are still a worshipper of the glitch. Horchata is the operating name of one Michael Palace, a research scientist at the University of New Hampshire's Complex Systems Research Centre in the USA. His "Acytota" collection activates fragments of samples sourced from field recordings, computer programs, computer code and effects packages, and fuses them into an emergent, striated, genteel series of pieces, that could easily be described as minimalism, but represent so much more than that. Palace's sound world has evolved from the language of minimalism, but bears resemblances to modern composition, and leftfield electronica, not to mention that dreaded "A" word... ambience. However, those world weary ambient acolytes amongst you will be glad to know that Palace neatly side-steps most ambient cliches by peppering his ambiences with curious distortions and deformations, time stretching and elasticising sounds, and reconfiguring their originating co-ordinates, leaving us with a very strange and compelling collection of works indeed. This I can highly recommend just for its explicit originality, and blistering creativity. Lastly, but by no means least amongst this crop of very fine releases, is the work of Mirko Uhlig, whose works I have previously encountered on the exceptional Mystery Sea, and France's Taalem Records. Uhlig's works are informed by some of the pioneers of drone music, citing such diverse and deviant sources as David Lynch, La Monte Young, and The Hafler Trio as major influencers. 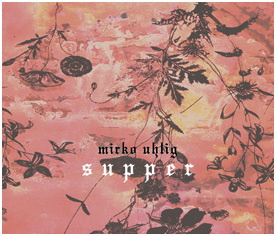 "Supper" is no clear cut drone work, however, as Uhlig adds texture to the drone with layered miniaturised soundscapes weaving in and out of the central drones, or overlays of pure sine-tone, adding further substance to a highly resonant textural field. Uhlig doesn't actively re-invent the wheel here, though his work is infused with streaks and smears of originality, taking drone into hitherto unexplored territories, with minute diversions into microsonics and glitch. Uhlig's work is up close and personal, as never does he resort to the overblown, amped-up reverb excursions exhibited by so many of today's drone practitioners. A great collection.